Actor Mansoor Ali Khan is a member of the Naam Tamilar Katchi and he is contesting in Lok Sabha Elections of 2019. 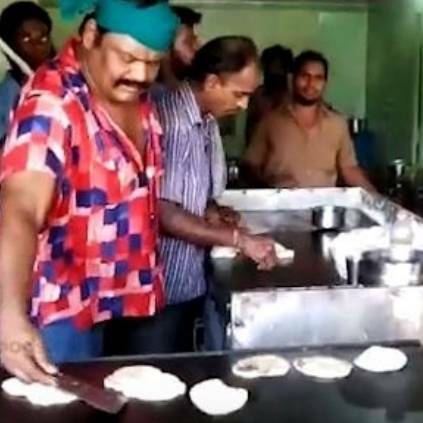 During one of his recent election campaigns, he has prepared Parotta, Bajji for the people in a shop and has mingled with them to attract votes. Mansoor Ali Khan has been campaigning by mingling with people and helping them do their daily tasks along with them. This is one of the newest methods adopted by a candidate during campaigns. In Senthur of Natham Taluk in Dindigul district, Mansoor Ali Khan has been campaigning recently to talk to people. During his campaign today, he had gotten into a shop immediately and taken up the role of preparing Bajji, Parotta for them. This seemed like a friendly and nice way of campaigning to attract voters. This act of him surprised the people very much and shared their excitement and joy by taking selfies and pictures with him. People looking for online information on Mansoor ali khan, Naam Tamilar katchi will find this news story useful.